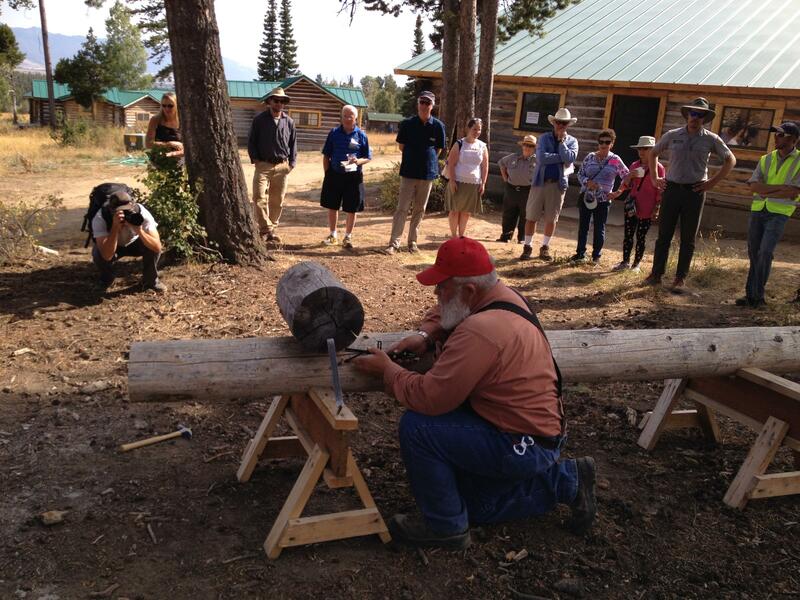 Volunteer Jack Shinkle demonstrates how to scribe a log before cutting a notch. In Grand Teton National Park, the White Grass Dude Ranch entertained visitors who came for mountain views and the chance to play cowboy. It closed in 1985 and soon the ranch's cabins and lodge started falling apart once people stopped using them. That's how White Grass joined a backlog of some twenty-seven thousand historic properties nationwide that the National Park Service couldn’t afford to maintain. But things have changed. 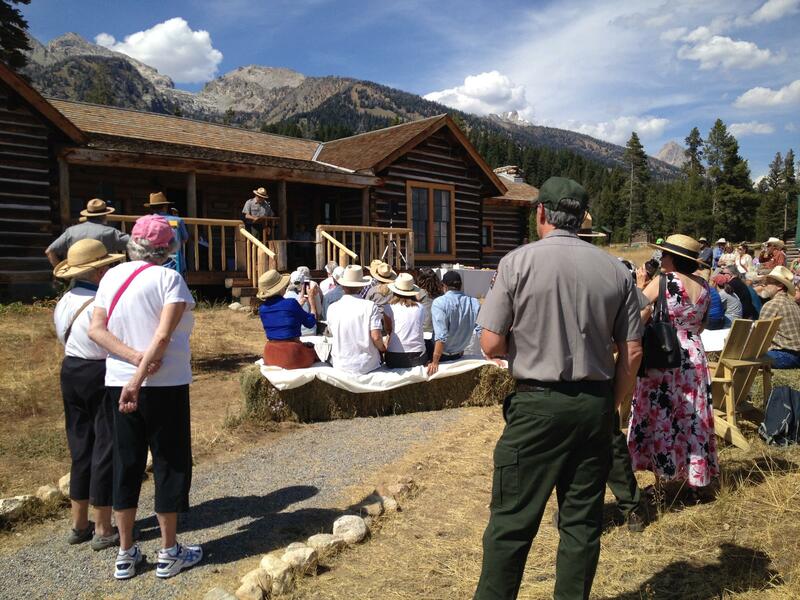 Grand Teton Superintendent David Vela welcomes the crowd to a rope-cutting ceremony celebrating the rehabilitation of White Grass Dude Ranch. At a recent rope cutting to celebrate the complete rehab of 13 rustic cabins at White Grass, Barb Pahl, of the National Trust for Historic Preservation, said she almost couldn't believe the ranch survived. "The first time I saw this place it looked quite different than the way it looks today. And White Grass along with many other historic structures in the park had suffered from years of deferred maintenance and was severely deteriorating and in fact, many of you remember, probably felt that it was too far gone to be brought back to this wonderful condition." Pahl said efforts to rescue the ranch started 13 years ago. That's when then Interior Secretary Gale Norton signed an agreement with the Trust's President Richard Moe to rescue the ranch. The Park Service has spent about two million dollars while the Trust chipped in another million dollars to restore the cabins. The main lodge and guest cabins sit scattered along the edge of a grassy meadow where wildlife still freely roam at the foot of the Teton Mountains. 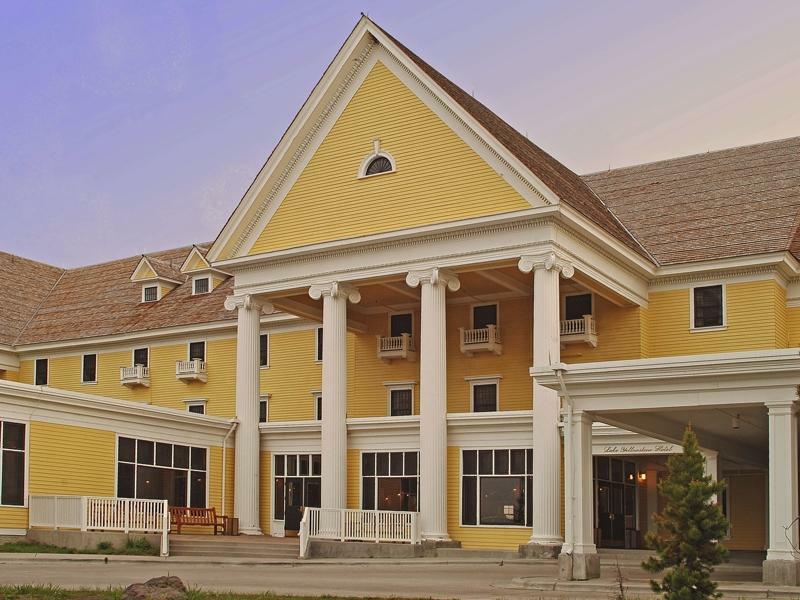 Homesteaded in 1913, White Grass capitalized on this magnificent setting, switching from raising cattle to entertaining dudes or those from outside the west, which was more profitable. Katherine Wonson is the director of the Western Center for Historic Preservation, now based at White Grass. She says it will now be a model training ground where people can come to learn how to do the same kind of restoration for other historic properties throughout the West. "And we're really the only center doing this on what we call traditionally built cabins so things like log cabins. Our range is so large, we work from Alaska down to Hawaii," Wonson said. 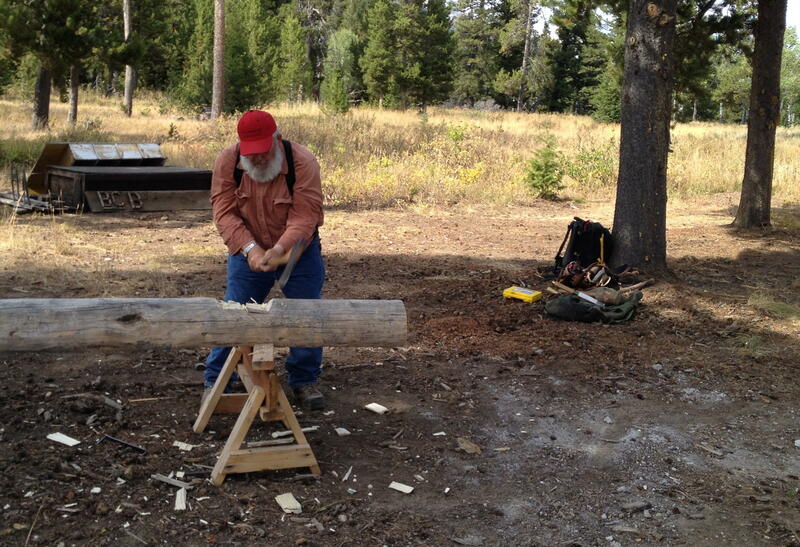 Volunteer Jack Shinkle uses an axe to cut a saddle notch into a log. Wood chips fly as a volunteer Jack Shinkle uses an axe and chisel to carve a saddle-shaped notch into a log. "All of these cabins, well most all of them, used the round notch in the corners and this is how they made the notches to fit," he said. It's just the kind of skill that will be taught here. Wonson said White Grass's resurrection marks a symbolic shift away from Park Service policies of the 1980s and '90s that favored letting buildings decay to restore natural landscapes. "So this has been a total shift in Park Service management, not just in this park but in a lot of large western, quote unquote natural parks -- to really bring cultural resources to an equal footing with the natural resources," Wonson said. Grand Teton National Park Superintendent David Vela agrees. "I don't frankly buy the notion that we have historical parks and natural parks, we have rich resource parks that have cultural values and natural values," Vela said. But he says that doesn't mean you can save every structure. "Because we have close to 700 historic assets in the park and if it were up to me we would preserve and protect every single one of them because every one of them has a unique story. But that's not the reality. So the reality is we have to look at which assets provide the greatest level and opportunity of preservation and protection but also provide a representative sample of the stories," Vela said. 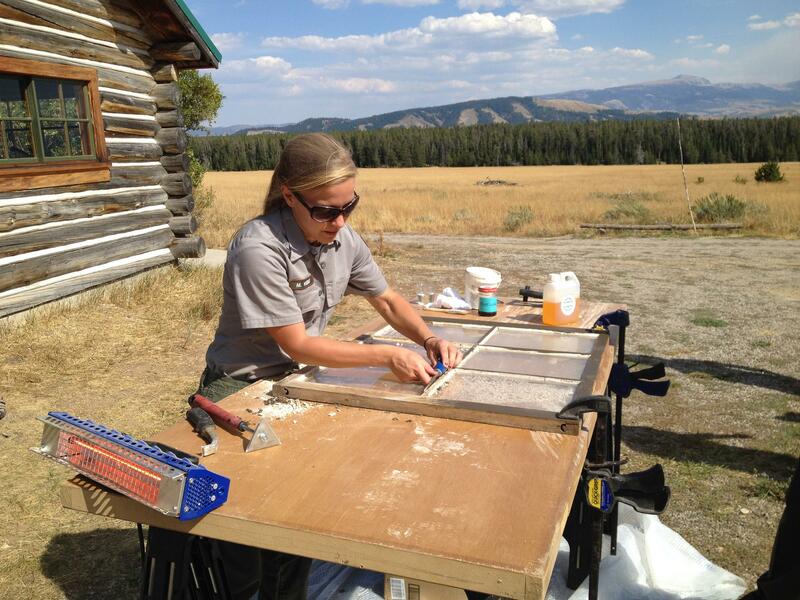 A park employee demonstrates how to rehab cabin windows. And White Grass has plenty of stories. Beth Thomas Woodin first came to White Grass as a guest when she was 8 years old in 1954. She returned often and eventually went from being a guest to working as a wrangler. "Oh I loved it. That was my life ambition was to be a wrangler at White Grass," Woodin said. Once she started working summers at the ranch, Woodin invited her childhood friend from Philadelphia, Olivia Meigs to join her. "When Bethy and I came out here we weren't even in a cabin, we were in a tent up in those woods. And that was in the day when the park didn't really have strong rules about bears and dumps. And so there we were up in that tent and there was a dump down there that was frequented by a bear," Meigs said. Woodin added, "And we were near the kitchen that was the worst cuz the bears would come to the kitchen and they had to come by our tent to get to the kitchen." Meigs agreed. "Yeah, it was kind of wild and wooly." Meigs even met her husband there. Just one of the many romances that made White Grassers, as they call themselves, fall in love with the place and want to save it. 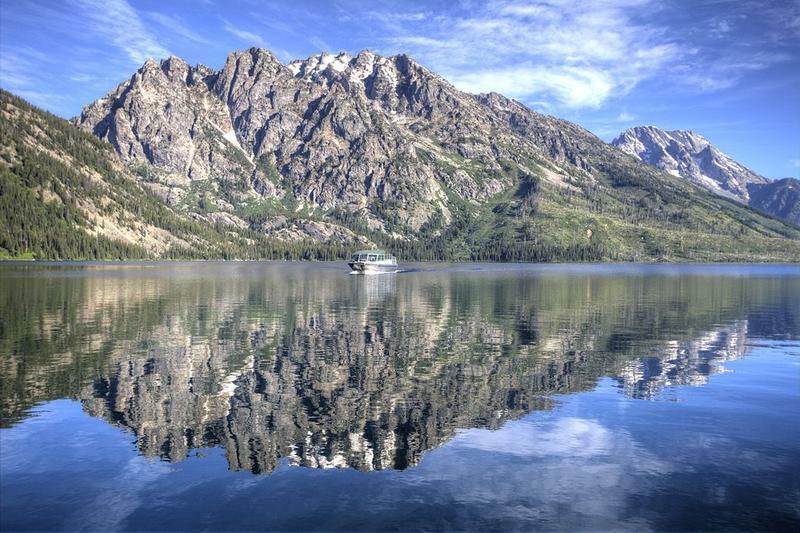 The fundraising campaign to improve the Jenny Lake area in Grand Teton National Park finished on schedule, just in time for the National Park Service centennial. The Inspiring Journeys campaign exceeded its goal of $14 million and has already contributed to improvements of backcountry trails, wayfinding paths, and visitor facilities. Construction that began three years ago is scheduled for completion in 2018. 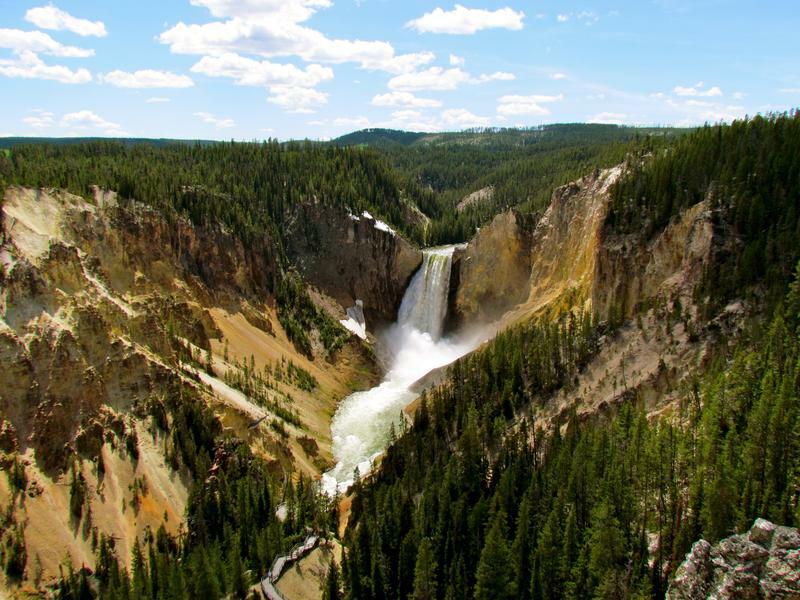 Yellowstone National Park celebrates its 100th anniversary of the National Park Service this year, but park officials are also looking to the future. Yellowstone Superintendent, Dan Wenk, says he hopes the next 100 years will continue to see conservation efforts, like working with neighboring areas to provide the best migratory routes for wildlife. A new book chronicles changes in Wyoming over the past century. Historian and photographer Michael Amundson has retaken hundreds of photos from the early 20th century. His photos, shot in 1987-88 (while he was a student at the University of Wyoming) and again in 2007-08 are studies of pictures taken by Joseph E Stimson, a commercial photographer for the state and various railroads. 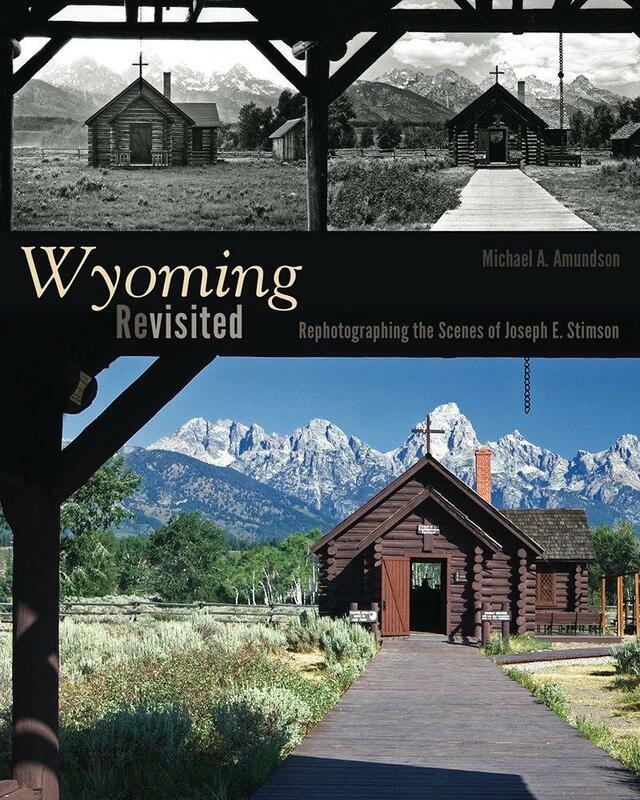 The book is called “Wyoming Revisted: Rephotographing the Scenes of Joseph E.